Another data point for the continued growth of construction in Williamsburg – Quadriad has (rather quickly) moved forward on the infill portion of its North 3rd Street development. The Bedford Avenue piece finished some time ago, and the Berry section is about to come online. Now the in-between bit is pushing forward. As I’ve noted before, the death of development in Williamsburg has always been over exaggerated – even in the depths of the recession, new projects continued to start up – but lately, it seems that there are fewer and fewer stalled sites, and a definite upsurge in construction. No one lives there yet. 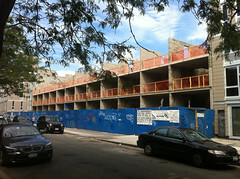 We live down the block, and the residential portions of all parts of this development are (inexplicably) not complete. They keep starting and stopping development, and they’ve thus far only completed 2 commercial spaces, though they will complete a new gym within a few months on Berry. Noticed that this evening – just about all the lights are out, and the residential entrance isn’t even finished. I guess commercial rents are carrying the project just fine.